An artist’s impression of the i-motif DNA structure inside cells, along with the antibody-based tool used to detect it. Guided by the work of Rosalind Franklin, James Watson and Francis Crick discovered the the twisted-ladder structure of DNA in 1953, a finding that gave rise to the modern field of molecular biology. It was by understanding DNA’s double-helix form that science was able to begin unravelling the many mysteries of genetic code. The double helix, though, is not the only form in which DNA exists. For the first time ever, scientists have identified the existence of a new DNA structure that looks more like a twisted, four-stranded knot than the double helix we all know from high school biology. 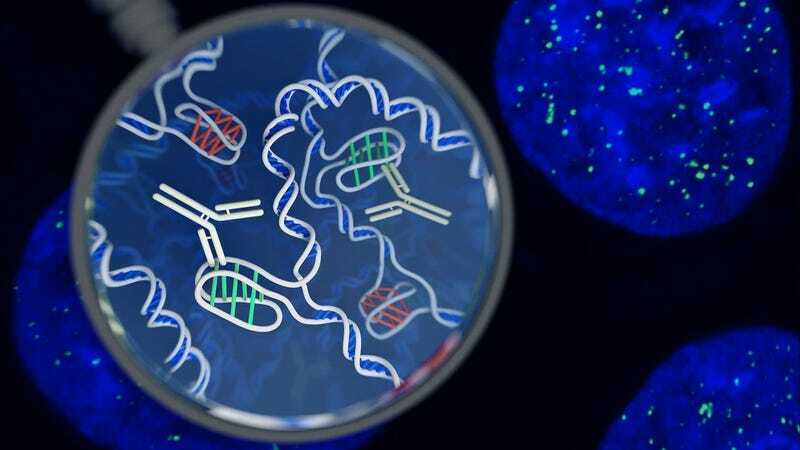 The newly identified structure, detailed Monday in the journal Nature Chemistry, could play a crucial role in how DNA is expressed. Some research had previously suggested the existence of DNA in this tangled form, dubbed an i-motif, but it had never before been detected in living cells outside of the test tube. Researchers at the Garvan Institute of Medical Research in Australia, though, found that not only does the structure exist in living human cells, but it is even quite common. A rendering of the “twisted knot” DNA structure. Its existence in living cells indicates that the structure likely plays a significant role in cell biology. In the double helix, nitrogen bases of adenine (A) forms a base pair with thymine (T), and cytosine (C) forms a base pair with guanine (G). Base pairs are stacked on top of one another, with two strands of a sugar-phosphate backbone twisting around them to form an elegant, spiraling ladder. This structure plays an important role in protein synthesis. The twisted knot structure only occurs in a relatively small region of a genome, like a knot in the helical double strands of DNA. In the twisted knot structure, Cs bind to Cs instead of to Gs. This phenomenon was first observed in labs in the 1990s, but for a long time it seemed that the structure could only occur under acidic conditions that did not exist inside a living cell. More recent work has shown the knots could also occur in other environments. On a hunch, Garvan Institute researchers developed an antibody that could sniff out i-motifs in the genome and identify them, tagging them with an immunofluorescent glow. This allowed researchers to see how frequently and where these knots of DNA occur. They found that the i-motifs are could fold and unfold depending on the acidity of their surroundings, and that the codes were generally found in areas of the genome involved in whether or not a certain gene gets expressed. This suggests the i-motifs may be some kind of switch that can regulate gene expression. It’s also possible that these tangles of DNA aren’t significant at all. In the lab, a number of DNA structures that don’t take the double helix form have been identified, including A-DNA, Z-DNA, and Cruciform DNA. Those structures, too, could exist within living human cells, but we don’t know for sure. Another DNA structure, called G-quadruplex DNA, was imaged by researchers in human cells in 2013, though the function of those structures is still being explored. What the discovery of this new structure makes clear, though, is that our DNA contains many more mysteries waiting to be unraveled.